The Majestic II 610-939 Curio Grandfather floor clock features an arched pediment which showcases book-matched, rare olive ash burl overlays on a Cherry case. A unique cast dial offers decorated corner spandrels and center disc with an astrological, blue moon phase. Finished in Windsor Cherry on select hardwoods and veneers. Celebrate your favorite dog breed every minute of the day with the Playful Pups Cuckoo Clock, featuring the art of acclaimed award-winning artist Linda Picken. Topped by fully-dimensional stunning 10-point buck sculpture. Honor an essential piece of American farming history with this Farmall cuckoo clock, an officially-licensed Farmall Times. This handsome barn-shaped wall clock showcases artist Charles Frietag’s full-color farming imagery beneath a vintage-inspired clock face that features an iconic Farmall logo. Honor the rich history of the manufacturer Allis-Chalmers with this barn-shaped Allis-Chalmers Cuckoo Clock. Over 1-1/2 feet tall, this handcrafted wood farm clock features classic farm imagery from renowned artist Dave Barnhouse. Let The Muppets bring laughter, entertainment, and lights to every hour with the Disney The Muppet Show Cuckoo Clock. Celebrate the delightful charms of Christmas Town from Tim Burton’s movie “The Nightmare Before Christmas” with The Nightmare Before Christmas Town Cuckoo Clock, a first-of-its-kind timepiece. This fully sculptural cuckoo clock is handcrafted and features Jack Skellington in his disguise, Lock, Shock and Barrel, Santa’s elves and Halloween Town toys. Honor an important moment in U.S. railway history with the Golden Spike Cuckoo Clock. Features intricately sculpted and vividly hand-painted wood case inspired by the train stations of the era. Features a unique moving train at the bottom of the clock. Rosemary Millette’s rooster art decorates the front of the wall clock while another sculpted rooster appears to announce each hour with a cheerful crow. Relive the allure of the Flying Scotsman with this 150th Anniversary Edition of a train-themed cuckoo clock. Features intricately sculpted and vividly hand-painted wood case. 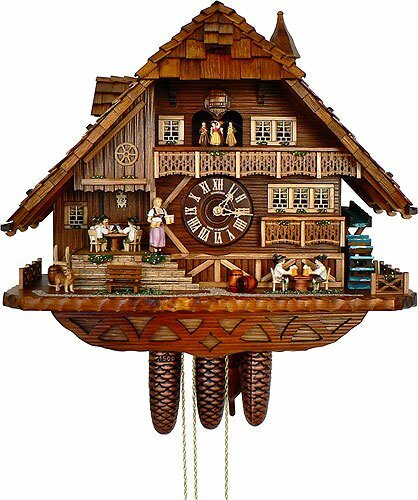 The feel and tradition of the old West come to life in this first-ever illuminated John Wayne cuckoo clock. An image of the Duke on his favorite horse, Dollor, takes center stage on the clock face that features old-fashioned numbers and golden hands. This impressive clock’s case is shaped like the castle of the Wicked Witch of the West and is superbly handcrafted from top to bottom, including seven hand-painted figures of your favorite characters. Pass the time with the lovable charm of German Shepherds with the German Shepherd Cuckoo Clock. Two of Linda Picken’s most engaging German Shepherd portraits grace this custom-crafted wooden wall clock inspired by traditional designs. This unique wall decor is expertly handcrafted with a black-hued wooden case, complete with gleaming chrome-finished accents and textured leather panel for a contemporary twist on a time-honored classic. A sculpted eagle, handcrafted in fine artist’s resin, soars at the top of the case. PERFECT GIFT- Great gift for any occasion. Your friends and family will feel special with this amazing looking vinyl wall clock.